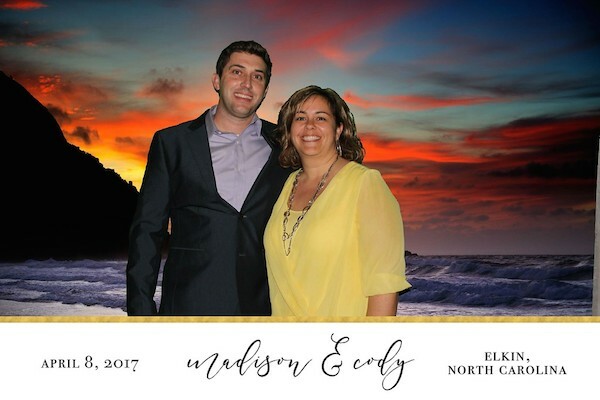 When you run a photo booth business, there's nothing like participating in your first wedding reception, and for Pamela Lietz - owner of TapSnap 1205 in Raleigh, North Carolina, the nuptials between Madison and Cody did not disappoint. The destination wedding was hosted in the foothills of the Smoky Mountains in Elkin, NC, a small tourist town with loads of charm. 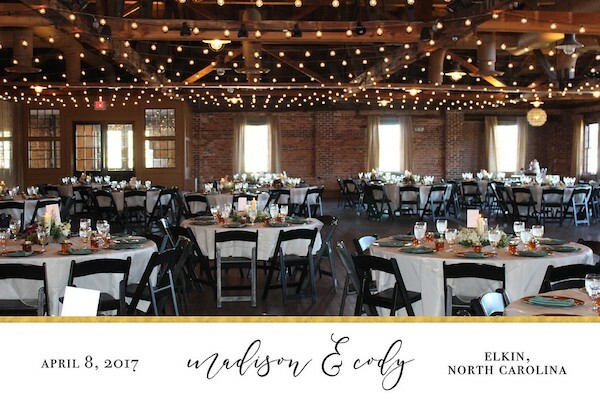 To match the wedding theme of gold and emerald green, Pamela and her team designed some green screen backgrounds that matched the rustic decor of the venue, and added a digital border with text noting the date, location, and names of the couple to be wed, with the font matching the wedding invites. At first, the wedding colours presented some challenges for Pamela. 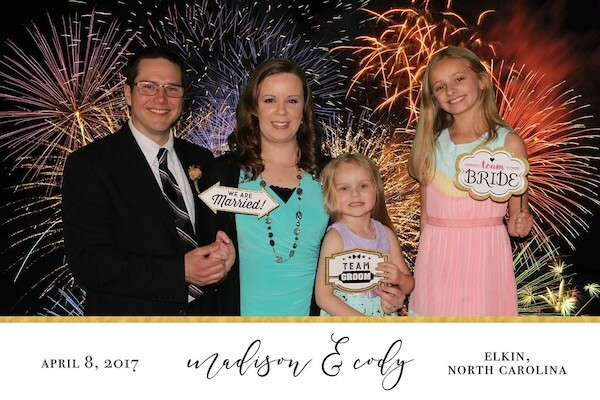 With the bridesmaids dressed in green gowns, it took some tricks to make the green screen backgrounds work effectively, but Pamela and her team found a solution and the group had a great time playing with the different props and backgrounds that were available. The photos worked out beautifully and the guests were impressed with the results. "For anyone with an event coming up, I HIGHLY recommend Pamela Lietz' business, TapSnap! It's the coolest thing ever! Think souped up photo booth. Where was this when we got married!?" The groom messaged Pamela from his honeymoon in Mexico to thank her for the great photos, sharing that he thought the photos were so great, they belonged in a magazine! 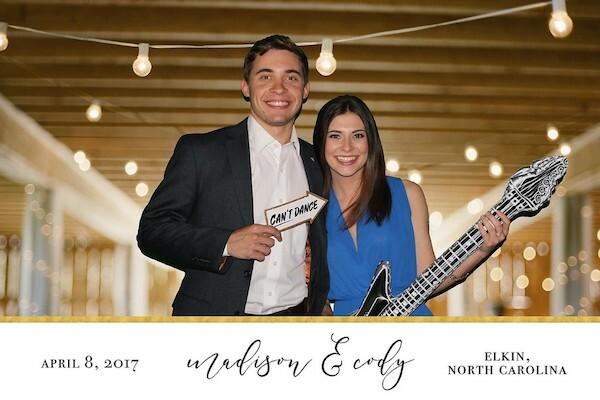 Adding a photo booth to your wedding is a great way to capture the memories and provide your guests with a keepsake to remember your special day. Not sure if a photo booth is the right fit for your wedding? Check out our post on why you should say "I Do!" 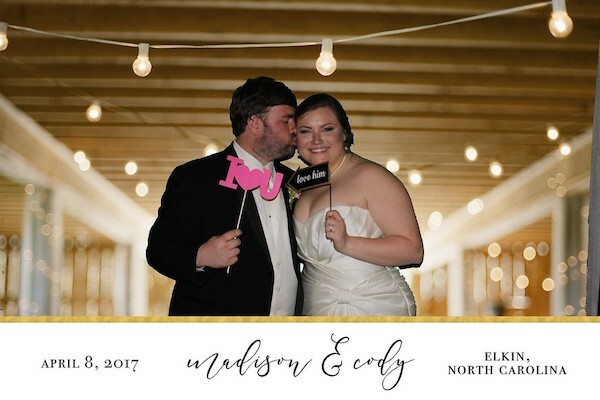 to a photo booth for your big day.